I came up with the recipe for this buttercream because I saw that a Seattle cupcake shop (which shall remain unnamed, but those of you who know me will know which one I’m talking about) had a salted caramel cupcake as a recently added flavor. Now, I find their cupcakes generally too sweet, and it has to do with that powdered-sugar buttercream that I can’t swallow. I’m not sure how that would fly with caramel on top of all that sugar (remember, caramel is sugar too, right?) so, curious, I set out to do my own. I tried to do a coconut cupcake because I love coconut, but the cake came out dry, so I’m still working on it. The recipe I started with was Ina Garten’s coconut cupcakes, but I’m not so big on those because I find sweetened coconut flakes kinda vile. I tried to replace it with regular coconut, but it didn’t turn out quite right, so I’ll have to do some more experimenting in this area (and I’m sure my family won’t want to ever see another coconut cupcake, ever.) The next time, I did a standard vanilla cupcake and it tasted really nice with the caramel. 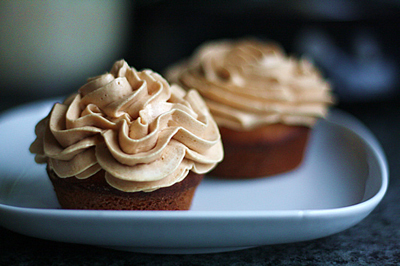 This uses a base of Swiss meringue buttercream with the caramel mixed in at the end. It is light and fluffy, but has good caramel flavor. For the caramel I added salt (I call it ‘salted caramel’ even though I always add salt to the caramel I make for say, leche flan). Sprinkle the cupcakes with some fleur de sel at the end and it will totally elevate the frosting to the next level. Note: I prefer to grease and flour muffin tins because I like eating cupcakes where I don’t have to peel off the wrapper, but the recipe does not change if you want to use cupcake papers. Preheat oven to 350 degrees with the oven rack in the middle position. Grease and flour a 12-cup muffin tin. With the mixer on low, add the caramel and mix until well-combined. Frost the cupcakes using an offset spatula. Sprinkle with sea salt.